All Terrain Lentry® Lighting—portable, telescoping, all-terrain safety lights with legs—will be shown in booth 4212 at the ICUEE Demo Expo in 2019. We are a featured exhibitor and listed here. 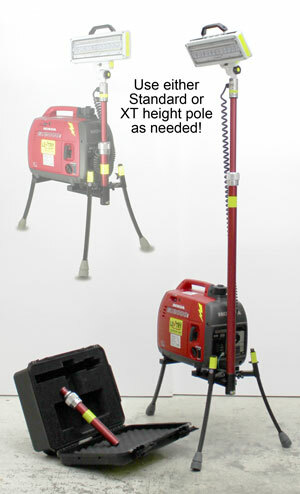 Which: OutSTANDing portable safety lighting will be found there! Check out ICUEE 2019 floor plan and click either All-Terrain Lentry Lighting or Booth #4212 under Exhibitors (on the left) to see where our booth is located. Registration: We will have a promo code to share which will give you a good discount off ICUEE 2019 registration. Send us a note if you wish to be alerted when there is a code. The ICUEE Expo website is icuee.com. Below is a little walk-through video of our exhibit at a previous ICUEE. You can see several models on display here, including 1SPECS-C, the 2-Headed V-Spec LED in its case, and models 2STARX and 2WIDEX in the background. We hope the International Construction and Utilities Equipment Expo affords you an opportunity to discover a new portable worksite light that reduces stress, makes every tool you use safer, and dramatically improves overall scene safety. Before or after ICUEE 2019, we encourage you to download product information, shop our catalog, request pricing or a quote, or contact us to discuss your needs. Light up your site and make your job easier, as did these railroad maintenance workers recently. Photo below is courtesy Wheeling & Lake Eerie Railway (Ohio). This photo shows how well their new model 2SPECX Lentry Light Tower works for them.